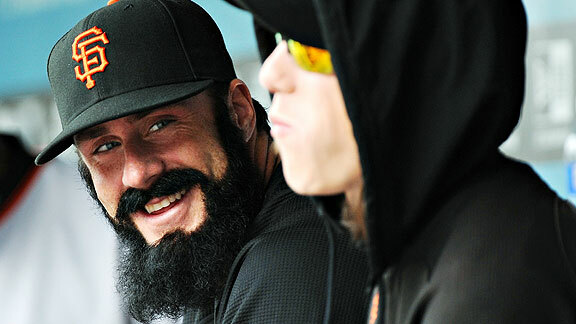 I love Brian Wilson. He is an excellent closer. He carried us through 2009 and 2010. But, I believe Sergio Romo is better. Looking at the last 4 years for both players, Romo has the statistical edge by far, even by ERA. Let’s look at the contact and control stats: Both players each have 2 best years for strikeouts per nine innings, Wilson with 9.57 and 11.2 in ’08 and ’10, Romo with 10.9 and 13.1 in ’09 and ’11, but Romo with the better average over that span. However, control is lopsided, which was Wilson’s Achilles. Wilson had the following walks per 9 innings from 2008-2011: 4.0, 3.7, 3.1, 5.1. Romo had: 2.1, 2.9, 2.0, 0.9. Romo put less than HALF the runners on base via the walk than Wilson. Granted, we all know how many times Wilson got out of walk-induced jams over the past few years, but that’s playing with fire. The walk percentage is even more telling. Wilson walks about 10% of batters he faces, Romo about half as much. Batting average against? Well, Romo has the edge 3 out of the last 4 years, and a dominant average. WHIP? Same, 3 out of 4, and that doesn’t even consider the dominant 2011 Romo had, while Wilson had his worst year in 2011. Romo dominates every statistical category (aside from saves, of course). These are two pitchers heading in opposite directions. Even the speed data, which Wilson relies on more than Romo, shows that Wilson is losing his edge. His average fastball speed for the last 4 years is 95.7, 96.5, 95.9, and a career low 94.2 MPH last year. He’s losing his stuff. Granted, he was hurt last year, and probably played through some of it. However, if Chalupa man can’t regain a 95+ MPH fastball in the beginning of the season, I think we know the trend line is confirmed. I hope it’s not true, but the Giants made shrewd moves signing Romo, Lopez, and Affeldt to multi-year contracts. I think it’s clear that Wilson is not the Giants’ closer for long. I’ve wondered why Romo hasn’t been given more chances to close. Hopefully, like the best veteran closers, Wilson will learn to pitch and not just rely on his stuff a la Rivera.